In serial storytelling there is almost always a span of time following a major earth-shaking event where the logical question is “what’s next?” How does a writer move on and keep their world interesting after a monumental storyline has been resolved? This is the challenge writer Dan Slott has faced since the resolution of Superior Spider-Man and the rebirth of The Amazing Spider-Man. It’s not that Amazing Spider-Man has been boring—Slott has done a wonderful job tying up loose threads left hanging from the Superior Spider-Man storyline while further complicating Peter Parker’s life. In fact, Slott has maintained the book’s perfect mix of pace, character development, and superhero action. But it’s all felt a little lackluster following the epic drama of Superior Spider-Man. While Amazing Spider-Man #9 is marked as the official chapter one of “Spider-Verse,” readers who didn’t follow the prelude, “Edge of the Spider-Verse,” will probably find the official beginning of this storyline confusing. What the “Edge of the Spider-Verse” books did was introduce or re-introduce several alternate reality Spider people. 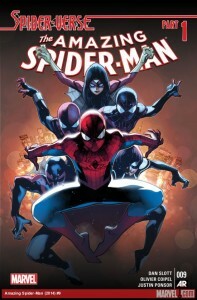 There’s the return of the Noir Spider-Man, a Gwen Stacy with spider powers, Billy Braddock of the Captain Britain Corps, and an alternate reality Peter Parker daughter in Mayday Parker. There’s also the Superior Spider-Man, Kaine, and Spider-Man 2099 hanging around. And Spider-Ham. Let’s not forget Spider-Ham. Amazing Spider-Man #9 picks up the story as our Peter Parker is drawn into the conflict. The alternate reality Spiders have been jumping dimensions in an attempt to save their brethren, and now they’ve come for Parker, Silk, Jessica Drew, and Spider-Girl. While Parker finds out his importance in the Spider-Verse, the Ultimate Universe’s Spider-Man is ushered onto the stage as the next target of the hunt. It’s no surprise Slott does an excellent job of kicking off the event. He’s mastered Spider-Man. The issue is equal parts fun and action—just what a Spider-Man book should be. Olivier Coipel and Justin Ponsor’s art and colors add to the tone, alternating between whimsy and darkness. Their combined efforts make for an intriguing first chapter of the “Spider-Verse” saga, an event that could be the next defining moment in a comic run that is among the all-time very best in comics history.